Please add $14.50 for shipping, handling, and insurance. This item comes with free shipping, handling, and insurance. Ask us about a free gift when you call! In researching material for this piece, artist Rod Chase spent a week in Washington, DC. During early morning and twilight hours, he photographed many buildings and landmarks to get a feel for the light and color. During the daytime hours, he visited The National Archives and the Library of Congress pouring over hundreds of old black and white photographs in order to locate the background materials required for America's Home. As a result of this due diligence, America's Home elegantly reflects the White House of yesteryear, making it an exquisite addition to the artist's Foundation of Freedom series. Chase's exquisite, elegant style makes him perhaps the finest photo-realist working today. 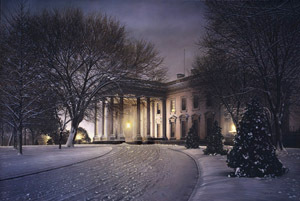 America's Home is the second painting in Rod Chase's Foundations of Freedom series. America's Home copyright© 2002 by Rod Chase is prohibited from being copied. All applicable copyright© laws apply and are reserved by Rod Chase. Web pages copyright© 1998-2014 by Christ-Centered Art. All Rights Reserved. 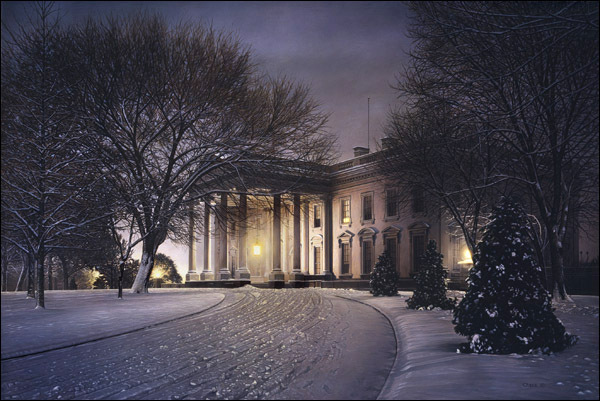 Rod Chase art, Foundations of Freedom series, The White House, Washington DC, historical landmarks, patriotic, Americana, artwork, art work, canvases, images, paintings, pictures, and prints of America's Home by artist Rod Chase for sale. America's Home painting by artist Rod Chase can be purchased in art print or canvas form at special sale prices at Christ-Centered Art.